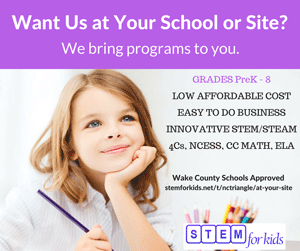 STEM Trackout Camps, Summer Camps, After School Programs, Before School Programs, In-School Field Trips, STEM Saturdays, Holiday and Teacher Workday Workshops and Classes in various locations across the Triangle Area in Raleigh, Morrisville, RTP, Durham and Cary. 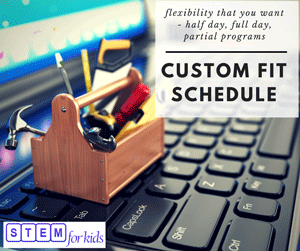 Many of our programs allow you the flexibility to customize schedule to make it the best fit for your needs. Select "Partial" schedule when registering. Tell us what you need and we will adjust pricing so you pay only for what you need. We provide engineering programs and computer coding and robotics and business and bio-medicine. 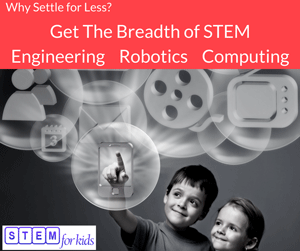 Give your children hands-on experiences in the multi-faceted world of STEM. Do not settle for anything less! New themes are added regularly. We bring programs to your school, homeschool, community learning center or organization site. No hassle STEM - materials, equipment, instructors - where you need it!